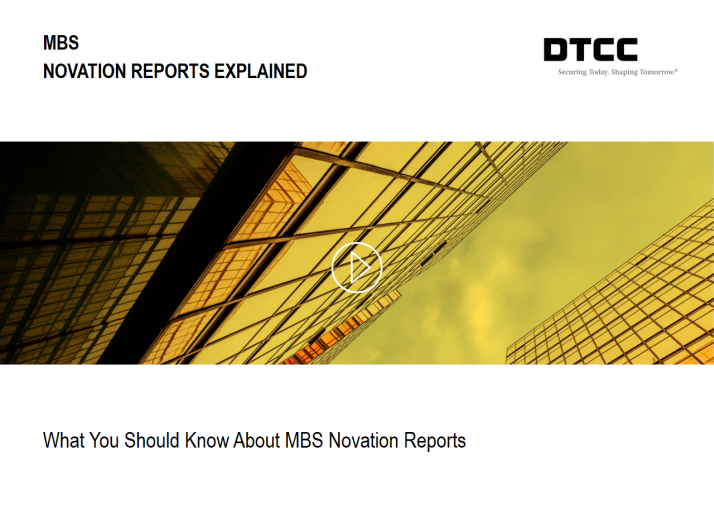 The MBSD section of the DTCC Learning Center provides information about all of the products and services of the Fixed income Clearning Corporations's Mortgage-Backed Securities Division. The Mortgage-Backed Securities Division (MBSD) is the sole provider of automated post-trade comparison, netting, electronic pool notification, pool comparison, pool netting and pool settlement services to the mortgage-backed securities market thus providing greater efficiency, transparency and risk mitigation to this specialized market. Fixed Income Clearing Corporation (“FICC”) would like to remind the Mortgage Backed Securities Division (“MBSD”) and the Government Securities Division (“GSD”) member firms of the guidelines that should be followed in the event that they are experiencing internal system issues and require an end-of-day extension to submit trade input. As mentioned in Important Notice MBS# 661-19, the Single Security Initiative is a joint initiative between Fannie Mae and Freddie Mac, under the direction of the Federal Housing Finance Agency, to develop a common mortgage-backed security referred to as the Uniform Mortgage-Backed Securities (UMBS). Subject to the Securities and Exchange Commission’s approval, Fixed Income Clearing Corporation (FICC) will accept UMBS for processing through the Mortgage-Backed Securities Division (MBSD) and the Government Securities Division (GSD) (for purposes of GSD GCF Repo® Transactions backed by mortgage-backed securities). As a reminder, MBSD is currently available for testing with MBSD Clearing Members and EPN-Only Members on the Single Security Initiative. For more information on the Single Security Initiative, please refer to http://www.freddiemac.com/mbs/single-security/ or http://www.fanniemae.com/singlesecurity. The proposed rule change would amend the Mortgage-Backed Securities Division Clearing Rules, and the Government Securities Division Rulebook. DTCC offers enhanced access to all important notices via a Web-based subscription service. The notification system leverages RSS Newsfeeds, providing significant benefits including real-time updates and customizable delivery. To learn more and to set up your own DTCC RSS alerts, visit http://www.dtcc.com/subscription_form.php. To learn more about MBSD products and services, please select a topic that you would like to learn about from the menu located to the left of this article.